Do you remember when Google+ was the next “Big Thing.” The mighty Google had created a new social networking product that was going to overtake Facebook and Twitter because it was newer and better. And well, it was Google. Things didn’t quite work out like that, and now Google+ has been consigned to the digital scrapheap. The consumer version is being shut down over a 10-month period. Which is a shame, because it had some really good features. It’s difficult to pinpoint why Google+ failed while other new products have taken off, like Instagram and Snapchat. But fail it did, despite having the backing of one of the most successful digital companies in the world behind it. Why am I sharing this with you? Because it demonstrates very clearly that you can’t rely on social networking products for your marketing. If you are one of the unfortunate businesses that invested a lot of time and effort in Google+, sadly that is now wasted. The connections you made in your Google+ ‘Circles’ as they were known, the content you posted and shared. All lost. To avoid the loss of your content and connections make sure that your website is the focus of all your online marketing. Don’t rely on social media. Your content is safe if it’s on your website.Your connections are safe if they are on your e-mail marketing list. You own your website. You own your email marketing list. But, at the end of the day, your Facebook friends and your Twitter followers are owned by Facebook and Twitter. So are all your posts and tweets. Social media can be a great marketing tool. But use it wisely and, when you can, point your social connections to your blog and website. And encourage them to sign up to your list. Then you can be sure that they won’t disappear! If you have a WordPress website you need to be aware of an imminent, and quite major change to its editor. The next WordPress update will include a brand new editor, called Gutenberg, replacing the current one with a ‘drag and drop’ style editor. In the long term this will make editing your WordPress website easier and more flexible. In the short term however, it may cause some problems. Plugins – pieces of code specifically written to provide added functionality on WordPress websites, may not work as expected. Most websites are updated automatically by the hosting company. Regular upgrades are necessary, mainly for security reasons. It is not clear when the upgrade will take place. It could be any day from now on. You can install a plugin called the Classic Editor. Activate this and your website will revert to the old editor that you are used to. Instructions below. Websites built using standard WordPress themes and widely-used themes, for example Divi, should not suffer too many Gutenberg-related problems. Websites that have bespoke WordPress themes may not fare so well. If you are confident about installing plugins and have Admin access to your website go to your WordPress Dashboard and select Plugins. Search for the Classic Editor plugin, install and activate it. If a plugin no longer works correctly check in the Plugins section of your Dashboard (as above) that you have the most recent version and, if not, update it. It may have been updated for Gutenberg. If it still doesn’t work you will need to find another plugin with the same functionality. Not great. If you do not have Admin access, or if you are not confident about making these changes, contact your web developer. I hope your WordPress upgrade goes smoothly. Fingers crossed! This entry was posted in Writing for the web on February 18, 2019 by admin. The great thing about marketing your business online is that mostly it’s free. Or should I say, it seems like it’s free. 1. Eating up your precious time! Social media is highly addictive.You can easily waste many hours having fun on Facebook! It’s easy for new business owners to dive straight in, full of enthusiasm. They start to use lots of different online marketing tools to get their message out there. But, after an initial spurt of activity they quickly run out of steam. Short of ideas, and exhausted trying to keep up with it all while running a business! Have a Plan and Get Organised! Work out the topics you want to cover in your blogs or emails in advance. Ideally for the next 6 months. Then there are no last-minute panics because it’s time for another blog post and you’ve no idea what to write about! Make sure you include links to your other blog posts and to pages on your website. That you are making full use of every piece of content you produce. And encouraging prospective clients to buy from you as they get to know, like and trust you. I hope some of these ideas work for you. Let me know how you get on! This entry was posted in Web Clarity on January 11, 2019 by admin. Neuroscience is becoming a key part of marketing theory. Research demonstrates that we tend to make decisions based on subconscious choices, rather than on a rational basis. This means that your potential customers are making their buying decisions based on the way they feel about your service or product rather than on a reasoned analysis of its features and benefits. The hugely successful online mattress brand, Eve Sleep, provide a good example of this. In their marketing copy they focus on how you feel in the morning after a good night’s sleep. More alive, more productive, more fulfilled. They don’t mention springs and mattress fillings! It’s all about being part of the Eve “Morning Person’ Club and living a balanced, healthy lifestyle based on a good night’s sleep. This is how you will feel if you have an Eve Sleep mattress! What does this mean for your business and your marketing, including your web copy? Think about the positive effects your service or product delivers. How do people feel after they’ve bought from you? This is what should be on your home page. Less about the details of what you do. (That can go on other pages which you can link to from the home page.) More about making people feel better. This entry was posted in Writing for the web on December 1, 2018 by admin. So you’re happy with the look and feel of your website, but you’re disappointed with the amount of business you get from it. Lots of websites look nice and contain interesting information, but they don’t really grab their visitors’ attention. Visitors leave the website thinking “I’ll remember that business. I’ll come back later.” But usually they don’t! They get distracted by other things. When they do get round to making a purchase decision they will have forgotten all about you. You need a Call to Action! Most of the people who show an interest in your service or product are not ready to buy now. Over 90% of them are just looking around and checking things out. The secret is to keep in touch with these potential buyers so that when they are ready to buy, you are the first person they think of. That means that your website needs to grab some contact details from them, so you can keep in touch. Every page of your website needs a Call to Action. Once they are on your email list keep them interested with a regular feed of high quality information in an easy-to-read, accessible style. You can use video too. It’s a marketing mantra that “The money is in the list!” These interested website visitors are your warm leads. Don’t lose them! Get them on your list with a compelling Call to Action and Lead Magnet. Encourage interested website visitors to follow you on social media as well. Make sure your social media icons are in a prominent place on very webpage. Even better, plugins are available for WordPress websites to display your recent social media posts. Contact me for a free ‘Call to Action’ consultation. This entry was posted in Web Clarity on October 8, 2018 by admin. How Does a Blog Help You Sell More Stuff? Many business owners find marketing and making sales difficult. It just doesn’t feel right to blow your own trumpet. If you love your business, but hate sales and marketing, blogging can be a godsend. This is because blogging allows you to be yourself. You can write about your service or product in detail, showing your in-depth knowledge and your passion for what you do, but without coming across as salesy or overhyped. A blog allows the authentic, real you to come across. 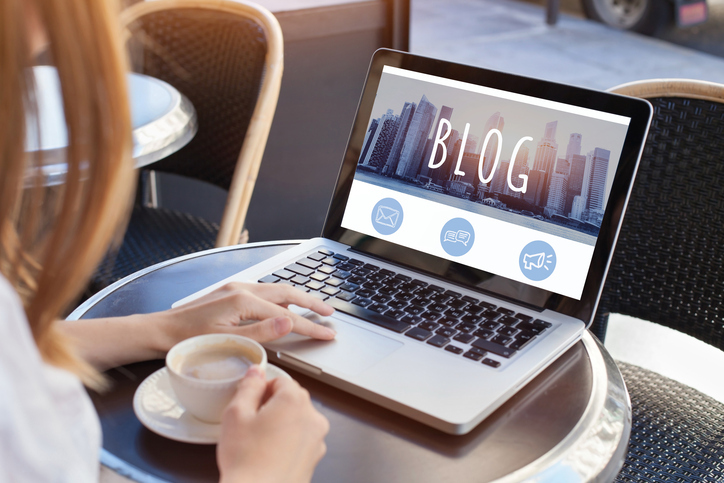 Writing a regular blog you build up an archive of fantastic material which is ready and waiting for anyone who visits your website and wants to find out more about you and what you do. It makes it easy to develop a relationship with the casual visitor to your website. By the time they have flicked through a few of your blog posts they will feel that they know you, they may well trust you, and pretty soon they will probably reach out to make contact with you. The hard work has been done and making a sale to this person is easy. You don’t have to prove yourself to them because they already know all about you and the great service or product you provide. If you use social media to promote your business a blog gives you the edge over your competition. If you post original content on your Facebook page or LinkedIn profile it is worth far more than a bunch of Likes and Shares. On Twitter, a snippet of your blog post and a link to the full post will raise your profile and drive traffic to your website. Hopefully this has convinced you to start blogging! If you need help or don’t know where to start get in touch. Next month I will share some advice on how to write your blog posts for maximum impact. This entry was posted in Blogging on July 3, 2018 by admin. Email marketing is the most effective way to market your business online. According to Hubspot, email marketing is almost 40 times better at acquiring customers than Facebook and Twitter! You are talking to people who have chosen to receive information from you. They are your “Warm Leads.” Make the most of that opportunity by giving them valuable, useful content. Then, when the time is right, they will buy from you, because you are the friendly, helpful expert they have got to know. Write your main piece of content about a topic that is of interest to your subscribers. This article should showcase your expertise and provide useful information and advice. Having given your audience lots of valuable information, this is the place to promote yourself. Mention your current Special Offer, your next event, or a service you especially want to promote at this time. Wrap up with a short conclusion. Maybe mention next month’s articles as a teaser. Remember to follow Online Copywriting Best Practice to make your newsletter easy to read online. Short sentences and paragraphs with headings, bulleted lists and images to break up the text. When your subscribers need you…. they will come to you! This entry was posted in Email marketing on March 6, 2018 by admin. In these days of social media frenzy, email marketing is often overlooked. The fact is, email marketing is the most effective way to market your business online. According to Hubspot, email marketing is almost 40 times better at acquiring more customers than Facebook and Twitter. Mailchimp is the most popular but there are others including Aweber and Constant Contact. These systems ensure that you meet regulations. This is especially important with the new GDPR coming into force in the UK in May next year. They also save you lots of time in keeping the admin effort required to a minimum. The best way to persuade your website visitors to subscribe to your email list is to entice them with a Lead Magnet. You offer them something of value for free – an ebook, a checklist, a discount – to persuade them to give you their email address. You must make it clear in their confirmation email that they will now be on your email marketing list, and give them the option to unsubscribe. Keep your emails interesting and of value to your subscribers. Advice and hints and tips are always well-received. Also comment on recent developments in your industry and news items. Always keep in mind why your subscribers signed up and keep your content focused on what will be of interest to them. Use appropriate images to make your emails attractive and follow the Online Copywriting rules – keep it short and punchy with headings, bullet points and images to break up the text and make it easy to read. And finally…… Don’t stress about Open rates! A lot of your subscribers won’t read your emails! But they will see them in their inbox and this reminds them about you. For this reason always make it very clear who the email is from. Your regular emails tell your subscribers that you are still in business, that you are reliable and that you are genuinely interested in helping your clients by putting out helpful content. When they need the service you provide you will be top of mind. Also your email may open automatically on a smartphone or Ipad, so Open rates can be misleading. When your subscribers need you they will come to you! This entry was posted in Email marketing on February 8, 2018 by admin.